Most hotels or guest houses in Myanmar include breakfast. Hotels or Guest Houses in Myanmar are usually more expensive than in other countries in South East Asia! Majority of the hotels in Myanmar do not accept credit cards at the moment, even if they do, it will be costly because of bank commissions. 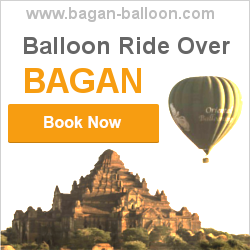 It is wise to book your hotel in Myanmar online. When you book your hotel in Myanmar online you are sure to get a room since you have a voucher to guarantee your booking. Agoda (over 700 Hotels listed in Myanmar) and Booking.com (over 500 Hotels listed in Myanmar) are at the moment the best websites to book your hotels online in Myanmar. Newly entered hotel booking websites to the Myanmar market like HostelWorld, Airbnb or Expedia list a limited number of hotels at the moment. Price range: Starting from a meager $10 per person per night for a dormitory to $40 per night for a room. Price Range: Starting from $40 per night to $120 per night. Most hotels in Myanmar fall under mid range category and facilities vary depending on the price and location. Price range: starting from $120 per night to $400 per night in top hotels of main touristic cities where you will get the real touch of elegance and style of luxury.